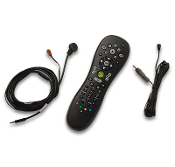 Note: This kit is for the WinTV-HVR-2250 board type 88061, which has on-board support for the Windows Media Center remote control. You can find your board type on the TV tuner label of the WinTV-HVR-2250. If you have board types 88041 or 88021, please click here for the correct Media Center remote control.